Yesterday at sunrise I awoke to music coming from the fields behind my hotel. The music is hard to describe — a little like bells or the gamelan music from Bali — energetic, rhythmic and not western. After grabbing a quick breakfast, I left the hotel and followed the sounds through a street market and unpaved roads to an alley. In the alley,the music blared from set of huge speakers. 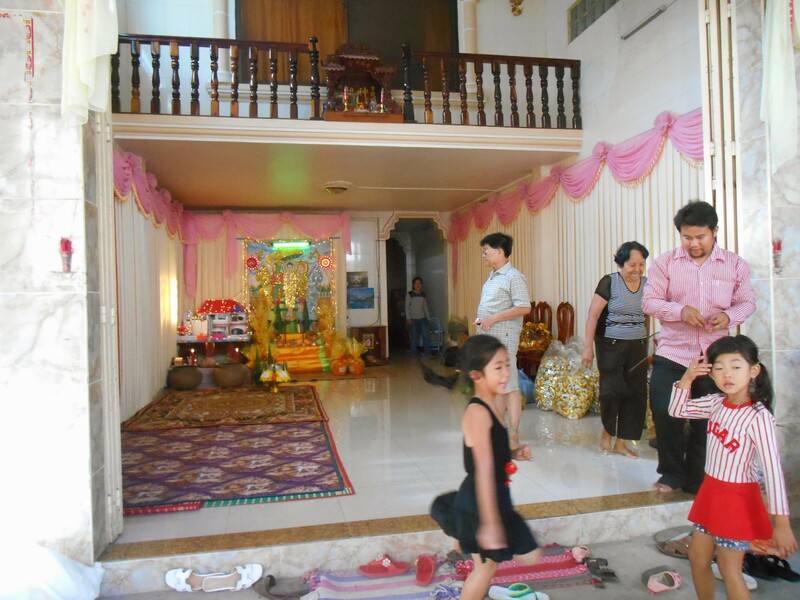 A family was gathered on the ground floor of their home, which opened to the alleyway like an American car port and was decorated with flowers, Buddhas and alters. I learned from the father of the household that the music and festivities celebrated the 100th day after his grandmother’s death. This 100 day ceremony is a Buddhist ritual and reflects the Buddhist view that death is not final but just one more stage in an ongoing process of birth and death and ultimately eternal peace, or Nirvana. On the 100th day after death, loved ones gather to honor the dead and help them navigate the next stage of their journey. Typically, the celebration includes feasting and stories and a religious ceremony lead by monks. The music I heard was played to keep the evil spirits away. I heard the music again this morning at sunrise. Also on my way to the music. 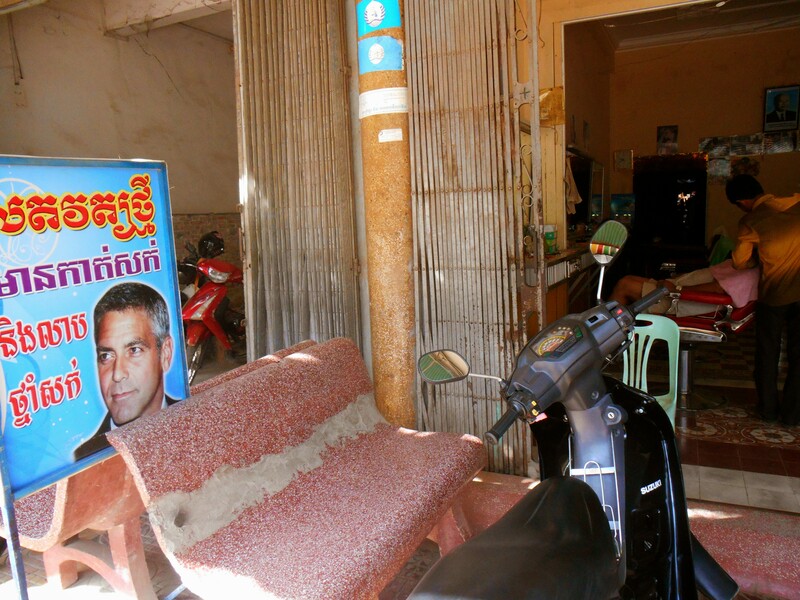 Apparently, George Clooney agreed to be in an advertisement for a Battambang barber shop. The music source, in honor of Grandma. 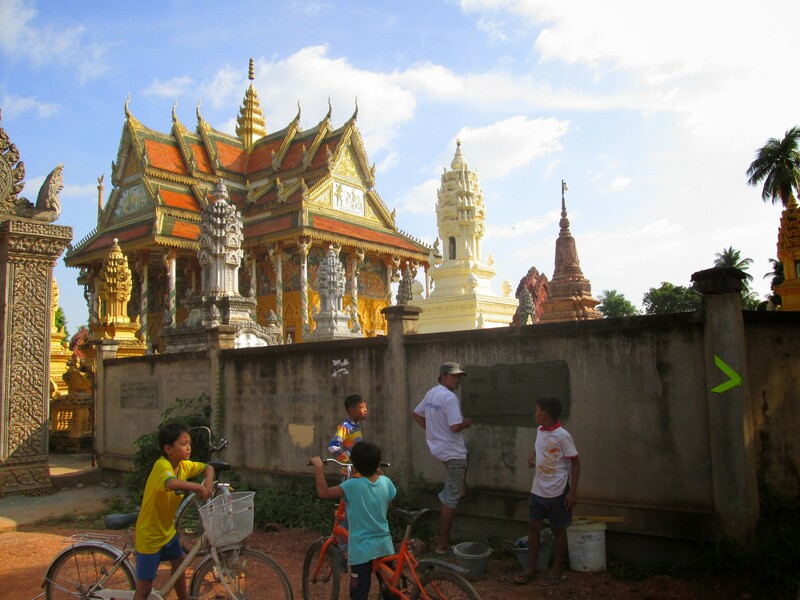 The musical mornings have been a wonderful introduction to Battambang and one that seems to represent its spirit. 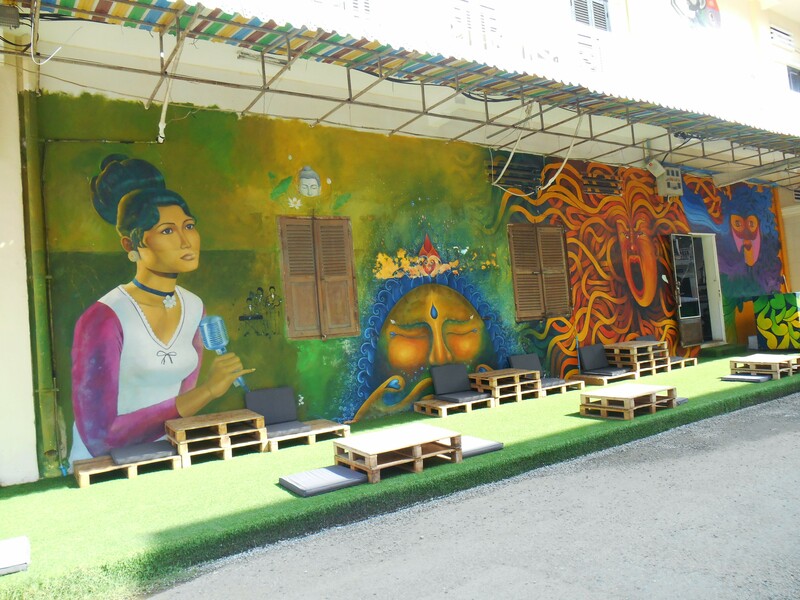 Although by American standards Battambang is poor and gritty like most of Cambodia, it has a small but thriving arts community, an obvious political consciousness and some interesting historic places. 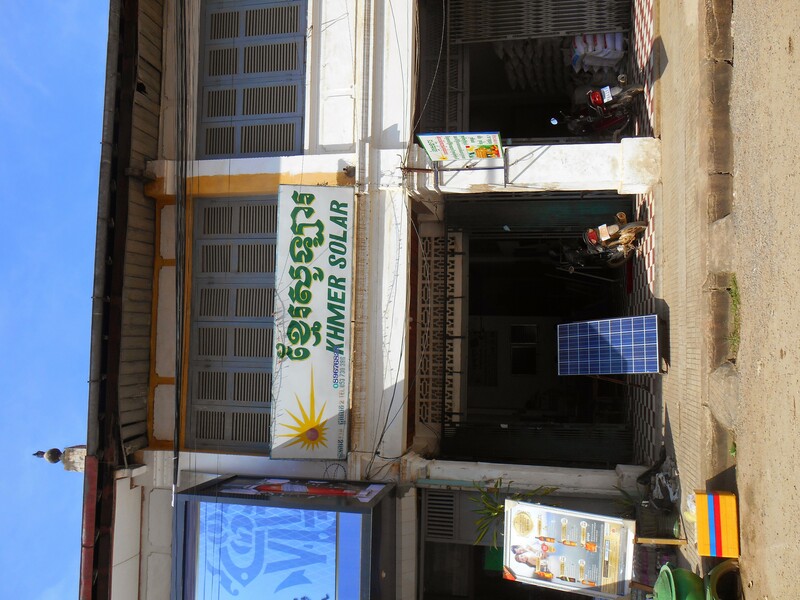 It seems to be crawling with small community-based organizations that support education, health, and environmental programs, many with revenues from enterprises serving tourists. 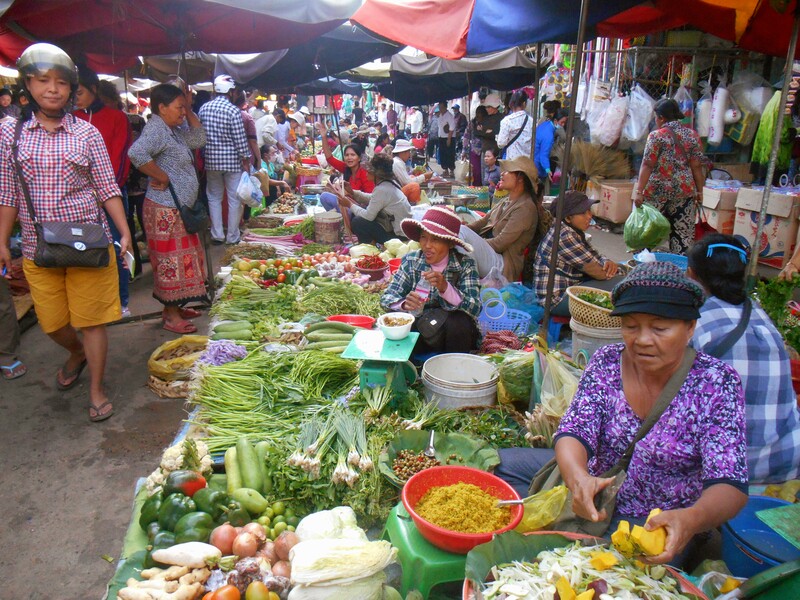 Battambang also has some great food. 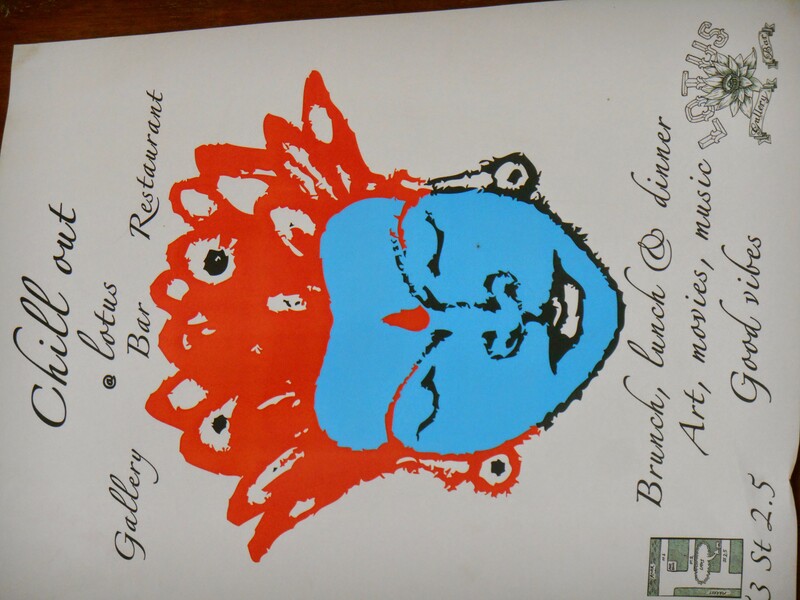 I have had fantastic espresso and gingery fruit juices, Cambodian style curries and an excellent gazpacho. 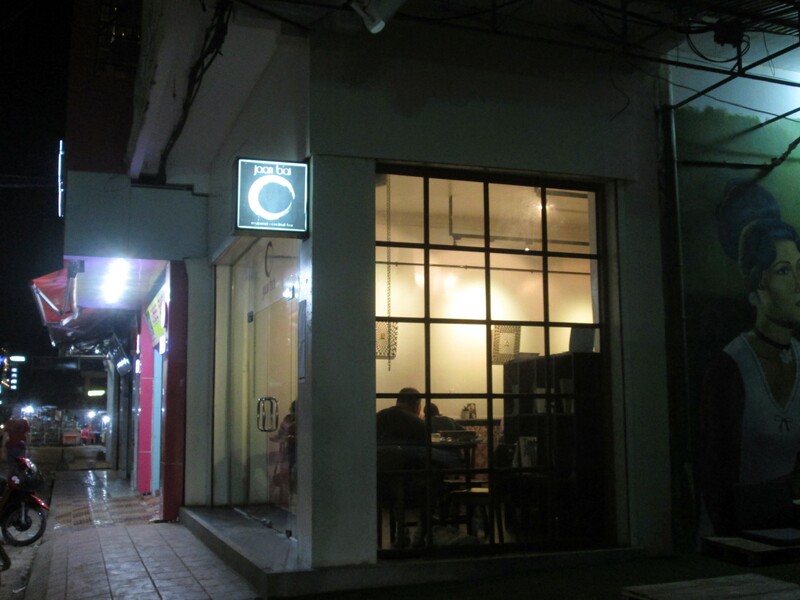 Because the French once colonized Cambodia, Battambang also has good breads and baked desserts (which are uncommon in Thailand because the Thais don’t want to increase the heat quotient by using ovens). There is also a more recent tradition of “happy” meals — mostly happy pizza and soup. That kind of happiness is not legal in Cambodia but it is an open secret that a number of tourist restaurants offer this kind of cuisine. Haven’t seen one of these in awhile! On my first day, I went on a bike tour through town to the local countryside. Our tour guides were college students volunteering for Butterfly Tours, which supports local educational programs for young children. 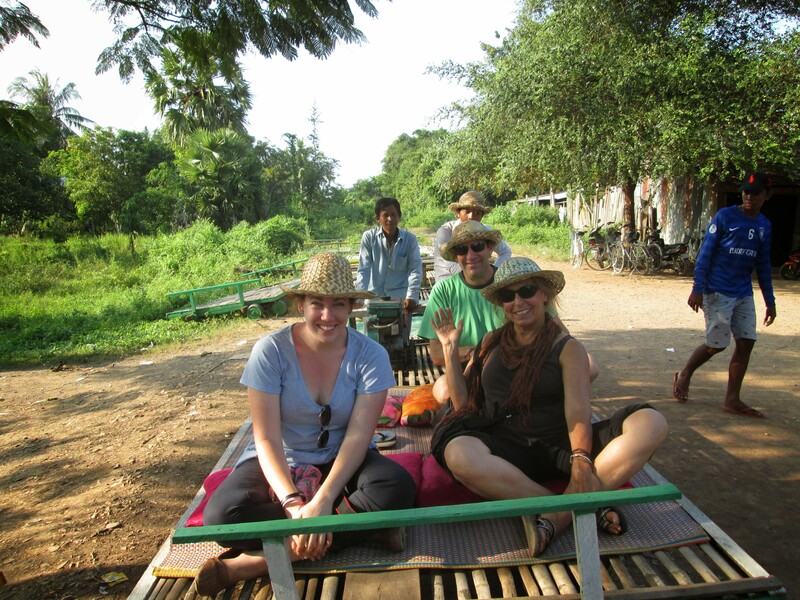 The highlight of the bike tour was a ride on the Bamboo train. The Bamboo “trains” are small flat carts that are powered by outboard motors and run on stretches of old railroad tracks. They are easily moved on and off of the line, which is necessary since there is only one line and many carts going back and forth with tourists and provisions for small villages. The Cambodian government plans to rebuild the the railroad infrastructure which will be the end of the Bamboo train. In the meantime, it supports many households in local communities outside the city. Countryside temple we passed on our bike ride. The bamboo train ride is quite thrilling — bumpy because of aging ties and speeds up to 30 mph. I am sharing my mat with Hannah from Australia. Taking a break along the Bamboo Train line. The rice paddies went on for miles in every direction. Today, I went kayaking down the Sangkae River, which is a tributary of the area’s largest lake, Tonle Sap. The river is slow at this time of year so our pace was leisurely and I got a good work out. 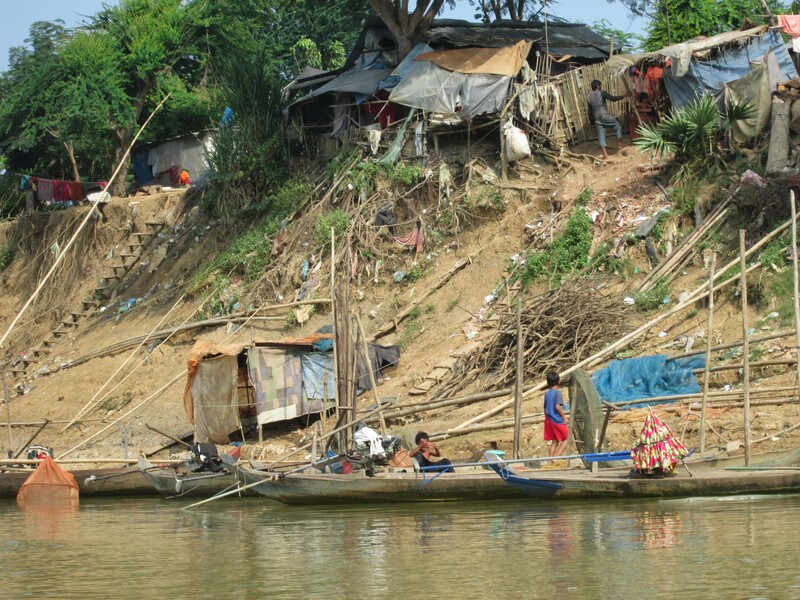 The river supports small farms along its banks, as well as providing fish and washing facilities to local households. My kayaking guide, Chenant is a junior in college, has a job teaching English to young children, and farms his family’s rice fields. 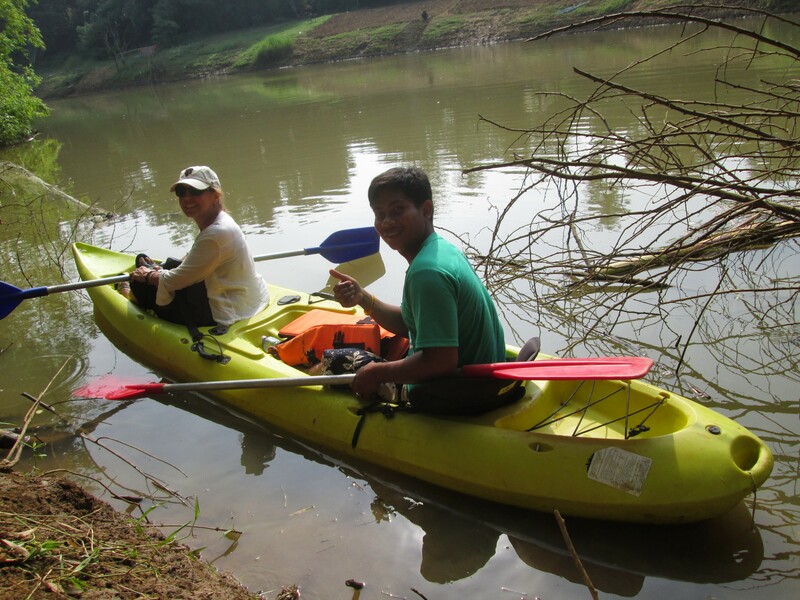 He volunteers his time as a kayaking guide because the kayaking organization, Green Orange, supports children’s programs. Chenant’s passion is teaching children so they have choices in their lives. He was so sweet and laughed easily. 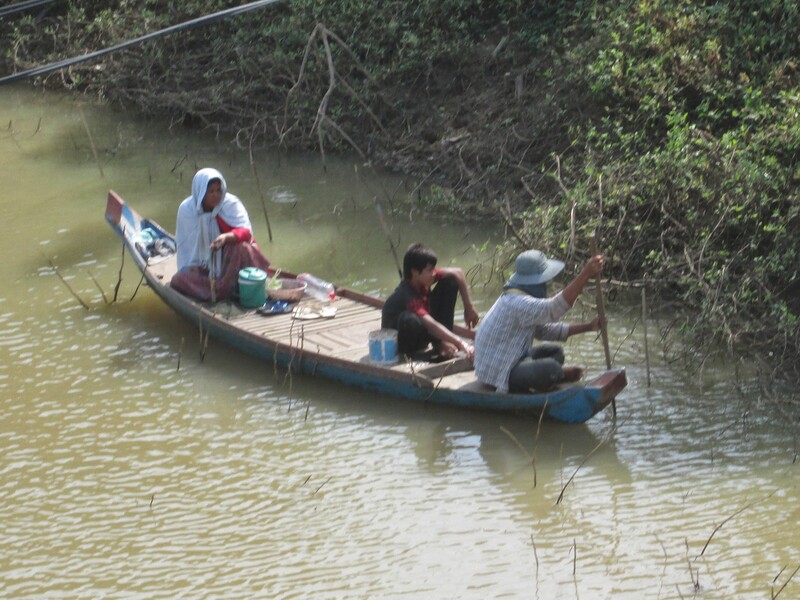 Most of the households along the river live in extreme poverty. .
Chenant eventually made me sit in the back because he thought my weight was causing the boat to list. Fortunately, the boat listed after I moved to the back and I didn’t hit him with my paddle. 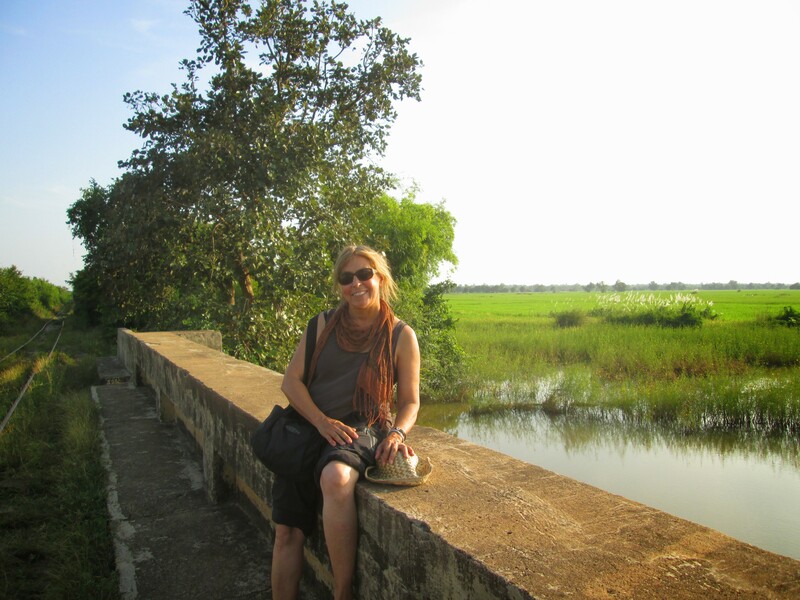 Battambang feels very special to me after only a couple of days. People here are very relaxed and friendly, and many speak English. The children go out of their way to say hello and seem happy in spite of their rough circumstances, which suggests that they know they are loved. This is one of your most interesting posts! I loved the stories and the photos… and the surprise ending that you didn’t clobber Chenant. Wow, that market photo is beautiful, so well composed. You should blow it up and frame it when you get home.